The first ride after a fall is usually the time where you slightly question yourself, or at least I do. I think it is probably normal to feel a little nervous, it was more on the way to the stables that I felt a bit of nerves kick in. Once I was there it just felt like any other lesson, finding out if we were in the school or out and who was riding who. I wasn’t given P this time although he was in the lesson. I’m not sure how I would have felt but since he is type of horse that feels when a rider is tense it was best for them not to take the risk. It was a good lesson, as always plenty for me to work on from it. I need to work on getting any of the horses I am on properly warmed up, the first exercise trotting circles around poles was very laboured for my pony and that was my fault for not getting her moving enough. As always her canter was beautiful, she is the fastest in the yard in the school – easily outpacing the larger horses. I need to be quicker to react than I was today as a couple of times she went back to trot when I should have been alert enough to catch her. All in all a successful lesson I feel, I didn’t tense up and I did enjoy myself. I have a private lesson booked for Friday as I am running a race on Sunday so expect a post about that lesson, they are normally good for giving me at least ten new things to work on. On the running front I had a terrible nine mile run yesterday although the hot chocolate to follow was great. It taught me once again that with 5 hours sleep and not enough water I am unlikely to be able to run far. That was my last long run before the first race of the year next weekend, I am looking forward to it although wish I felt fitter. On the WWC front I was quite pleased with myself when I managed to throw together a passable Cruella De Vil outfit on Friday night for for a friend’s birthday. Normally I would have thought about what to buy to make the outfit, this time I used fake fur left over from my homemade panda costume at Halloween and hunted out the gloves from a cat costume from years ago. It is a pity there are no pictures but that outfit will definitely be used again. Shame the white hair paint didn’t brush out, I got a few strange looks on Saturday morning during the run! So given I started a blog about horse riding I practically invited the fall I had today. As with everything horsey I do it did have a slight comedy element. So I fell off. Not a bad fall at all but a frustrating one. I really felt like I had been handling the horse pretty well as he spooked, jumped about and tried to race off (as a self-confessed nervous rider it took a lot for me to grit my teeth and stay on). It did go to show me that I can become a little complacent, expecting the horses to behave because they usually do. Sometimes it feels like you learn more when something happens as opposed to the lessons where everything goes perfectly. However, I could have lived without punching myself in the nose as I fell off! Today I am a little sore, mainly from checking the speed of a certain horse but I think also down to the ten mile run on Saturday. It was a tough one, full of hills and the first time in a while I have run ten miles. I have been slightly ill this week, just a sore throat and cold but enough to take all my energy so to complete that run felt like an achievement. I didn’t have my usual carbohydrate powder pre-run and I definitely regretted that, I also realised that the energy chews I have been using lately have definitely been helping. It is always nice to have confirmation what you are doing is helping. Not so great to have a headache and nausea for Saturday afternoon because you forgot though! A quick WWC update. My first eBay purchase has arrived. I had thought about buying a skirt before Christmas but told myself it was too expensive and not from one of the ethical companies I usually go for. I used the idea of the recycling aspect of eBay to happily spend a hour looking at all the things other people no longer want, then I saw a skirt. Brand new,with tags for a fraction of the price and I am giving it a good home! Author theInelegantHorseRiderPosted on February 18, 2013 Categories Horse Riding, Lessons, Running, Wartime Wardrobe Challenge1 Comment on Well it was inevitable.. So I mentioned the Wartime Wardrobe Challenge (WWC) in my last post and I thought it might be good to give a little more info on what it is and why I signed up. The challenge was created by Nik (http://www.littlehouseintown.co.uk/) and Meg (http://thedoublelifeofmrsm.wordpress.com/) and I stumbled across it by accident mid-way through January. I love a clothing challenge to help me try and focus my principles, this one will also help me to learn more about these principles and hopefully inspire me further. WWC is based upon the rationing system that was in place in the UK during WWII. Meg & Nik have updated it for the 21st Century by putting a sustainable/ethical bent on the rationing. You can read a introduction to the challenge here (http://www.littlehouseintown.co.uk/2012/12/introducing-the-wartime-wardrobe-challenge-2013/). Basically it boils down to having 66 clothing coupons to last the year. Different items cost different amounts of coupons and a coupon premium is charged where an item is not sustainable material. Vintage and second hand items are coupon-free. So why did I sign up to this challenge? Well ethical and sustainable clothing is an area that I am particularly interested in. Last year during Fair Trade fortnight I wore an item of ethical clothing each day and asked friends and family to try and guess which it was (come to think of it that was likely to be annoying). I was trying to show that ethical clothing is different to how some people perceive it. After that I resolved to only buy ethical clothing for a year, I failed in this resolution, try as I might ethical jodphurs are hard to come by! Next challenge then to try and get myself back on track came in the summer – The 6 Items Challenge (http://thesixitemschallenge.wordpress.com/). This one was tough but enjoyable. Luckily for me sporting gear was exempt from this challenge otherwise I was going to get some strange looks at the office! The 6 Items Challenge challenges you to wear only 6 items of clothing for a month. It was great to make me realise how one outfit can be worn so many different ways with changing accessorises. It also showed me that most people don’t realise that you are wearing the same 6 items, people don’t notice things as much as we think they do! And so to WWC. 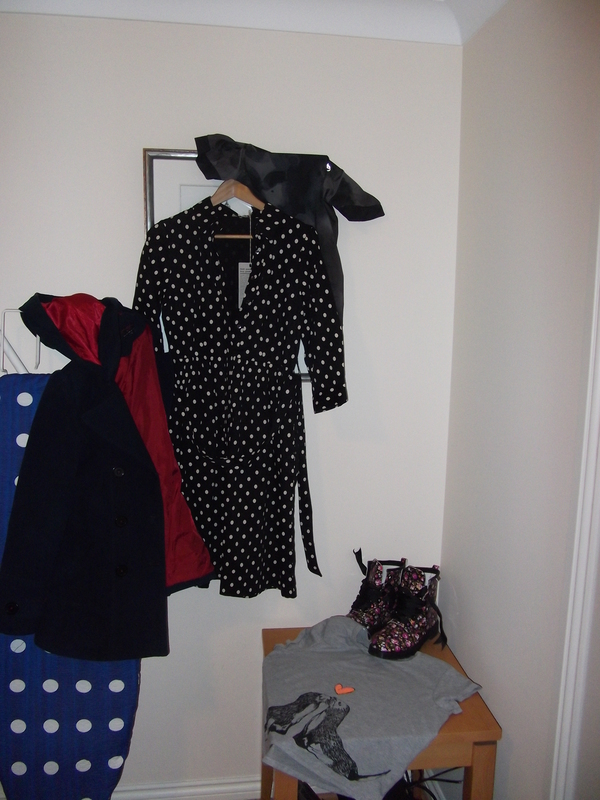 Well new year and I hoped new start with my finances and tackling my ever expanding wardrobe. However, the lure of the sales bargains were too much for me to resist and halfway through January I found myself with more money on my credit card and more unethical, unsustainable clothing in my wardrobe. Purchases from the sales, note the tags still on some! So at the end of my first month I have used 8 coupons (all sportswear although I have a slight addiction to buying sportswear so I have to keep that in check). However, I feel more focused and haven’t watched my bank account hemorrhage money….yet. I will post updates on WWC at least each month. I also hope to try and look into the idea of ethical sportswear and supply some reviews of the items I purchase. Wish me luck! Today was my first beach ride with my regular stables. It was brilliant. I had one of the steady horses, he is an old hand at beach rides having been previously stabled near the beach. Once we were all saddled up and on, it was off to do a warm up followed by a wee canter circle or two to feel if your stirrups were ok then… we were off. The feeling is difficult to describe when you are racing along a beach with friends on horses you trust. A sea with the odd mad surfer being tossed about in it to our right and patches of blue sky with sand blowing across the beaches in waves. It is exhilarating and part of why we all ride. I can’t wait for my next chance to do this. At one point during one of the gallops I looked around at us and realised that ‘Yes I can ride’, after my recent crisis of confidence it was a lovely way to spend a Sunday afternoon after my birthday! On another note it is only three weeks since I signed up for the Wartime Wardrobe challenge and I have spent eight of my sixty six coupons. I have bought new running tights to replace the ones with holes in and a vest top for the gym (or running if we get a summer this year). I deliberately chose the running leggings made from sustainable, cruelty-free merino wool but I still feel like I need more of the ‘make do and mend’ mentality. So in order to try and foster that I am planning to patch my old running tights, it might not work but better to give it a try than not. I will let you know how the patching goes, I may melt the running tights or destroy the iron but hey it’s not like I iron much anyway!